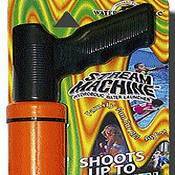 The Stream Machine Water Launcher TL-750 is an all around water toy! It's size is approximately 24 inches, which makes it easy for anyone to use from 8 to 88 ! It's a must have for those who have limited space, like a kayak, and it's perfect for around the pool.Shoots up to 70 feet !Re-Load Faster than your water battle opponent.